The title page of the catalogue shows the lion trademark but also shows the words Evans, Reliable, Cornish, Ram and Premier as if they were trade marks. It is doubtful, in the case of some of those words, whether they could have been a true trade mark. In the illustrations in the catalogue nearly every one of the pumps has the lion trade mark clearly on it. The indication is that when trying to identify an old pump the presence of the lion is a sure fire identifier but its absence is not conclusive proof that the pump is not by Evans. The catalogue illustrates at least 300 pumps and nearly every one of them is available in various conformations. 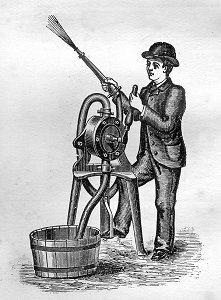 Although some of these pumps were certainly standards, and could be sent out to retailers such as agricultural suppliers and chandlers, most must have been assembled against an order. Indeed, the catalogue provides a detailed questionnaire which should be completed and sent with each order, presumably so that the company could check each order for its suitability for its intended use, advise accordingly and assemble accordingly. Here are just a few examples of the pumps in the catalogue. 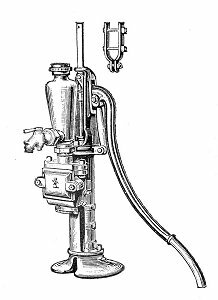 On the left is the Colonial or Cistern lift pump. 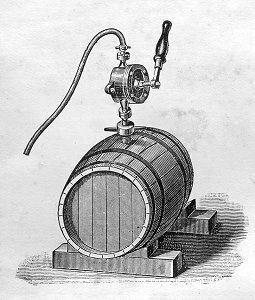 It came in nine sizes of working barrel, with (as here) or without fixing lugs, "screwed for tube or, if desired, arranged for lead pipes" and the handle could be on either side. These possible variations are typical of all the pumps in the catalogue. 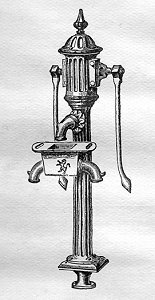 On the right is a Colonial or Cottage pump. 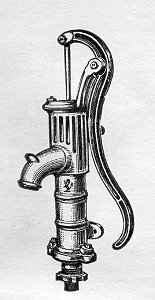 The catalogue contains many pumps which would have been suitable for supplying water to courtyard or terrace houses. The variant (left) is for "fixing in party walls where there is only one well to supply two or more houses". On the right is a pump "specially suited to village use". The brick like thing is a "bucket" to let into the ground below the spout. There is a wide variety of deck pumps - this one (left) is flush fitting with a hinged deck cover. On the right is a "strong standard lift and force pump for yards or public streets". 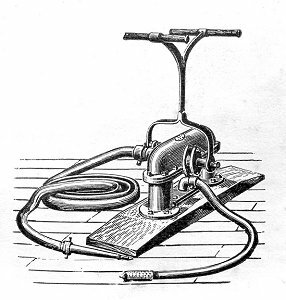 This is an Improved Colonial Lift and Force Pump "mounted on a wood wheelbarrow, which is a very handy portable arrangement". There is also a good selection of semi-rotary pumps. This one has a special tapered screw to fit in to barrels. What the barrel might contain the catalogue does not say - but surely it would not be beer. 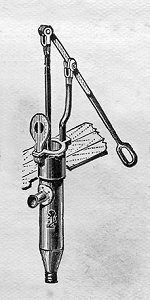 The semi-rotary pump on a tripod stand also has a foot valve. 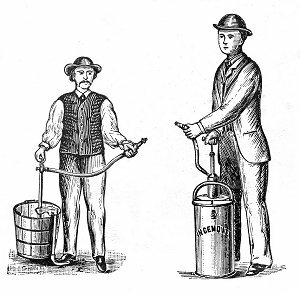 A certain degree of co-ordination would be required to pump with one foot and the opposite hand and to direct the spray with the other hand, all at the same time. 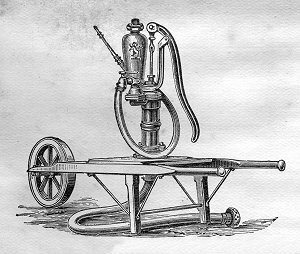 This is "our celebrated portable double-barrel ship's pump or fire engine, the same as approved by the Government Commissioners and adopted by the Royal Navy and Merchant Service". This is "our improved portable open top double cylinder irrigation, farm or fire pump". 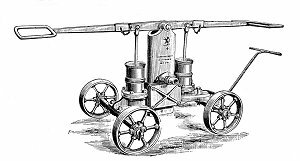 It is not notably different from the "fire engines" developed in the 17th century. And this variation is "our celebrated portable double acting contractors' lift pump. The smaller man on the left side is operating the Aquapult Force Pump which is "in extensive demand for washing windows and carriages". The larger man on the right side is operating the Incendie Force Pump which is a "portable hand pump for fire, window cleaning and similar requirements". (What activity is similar to both window cleaning and fire fighting is not specified). These three items show the range of uses for which a pump might be required. 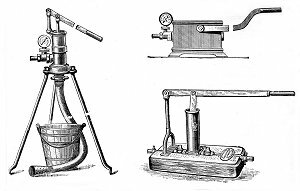 On the far left is a boiler proving pump (pail extra), top right is a hydraulic test pump (pressure gauge extra) and bottom right is a brewers' finings pump. The problems of deep wells did not daunt Joseph Evans - the one on the left is for wells up to 30 feet deep (greater depths costing more per one foot). The one on the right can be operated by bullocks (as shown) or by horses. 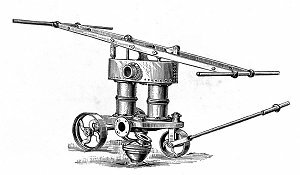 The front pages of the catalogue contain pages of useful information such as tables of liquid capacities, tables of English measures and "foreign equivalents" (that is, metric), rules for hydraulic calculations, and the heights to which pumps may be worked by a pony or horse walking at 3 miles an hour, assuming that "strong powerful horses or ponies are used". But "five bullocks are estimated to equal two horses in power, but they do not, as a rule, walk at a rate of more than 1 1/2 miles per hour". 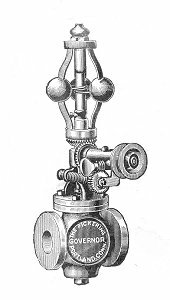 This is one of several pumps designed for windmill power. It is a double acting force pump, which can be adapted to either windmill or hand operation. The gadget shown is a forked rod or harp - which must be some sort of linkage between the pump and the windmill. 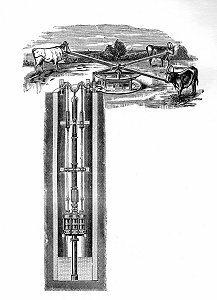 Each windmill pump in the catalogue is shown with its own forked rod or harp. The catalogue contains a number of hydraulic rams. These devices are used mainly for lifting water, acting by dropping water down into the ram through large pipes and ejecting it upwards through small pipes. Evans recommend a fall to lift ratio of 1:10 but provide a special questionnaire for customers to answer when ordering rams. The catalogue ends with a page of Pickering Governors, of which this is one. Each bears the label "The Pickering Governor Portland Conn". John Hobbs says that Evans sold between six and seven thousand of these governors. It is not known whether Evans imported them as agents (sole or otherwise) or made them under licence. John Hobbs thinks it probable that Evans did make them. 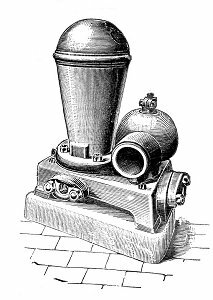 But the catalogue illustrations do not show any Evans trade mark on them, the catalogue refers to their being made from a special steam metal, which is not mentioned elsewhere, and to all the parts being interchangeable, a facility which they do not mention for any of their pumps. This rather suggest that Evans imported them ready made from the USA. Another possibility, kindly pointed out by Ian Scales of the Australian National University, is that they were made in the UK by Tangyes. Pickering governors were produced by Tangyes Limited at Cornwall Works, Birmingham.